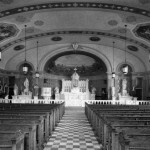 St. Wendelin Parish was established on May 3, 1903 by Bishop Ignatius F. Horstmann with administration of parish by the pastor at St. Michael Parish, Fr. Joseph Koudelka. On December 6, 1903, Fr. Koudelka celebrated their first Mass in a wood-framed church built at West 25th and Columbus Road. The following March, St. Wendlin welcomed their first pastor, Fr. J.P. Kunes who was succeeded a month later by Fr. Thomas Wilk. In October 1904, the Sisters of Notre Dame began classroom instruction in a 2 converted classrooms from the parish house. 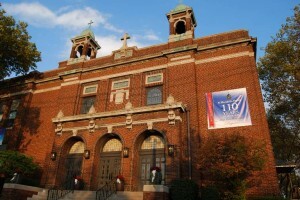 Growing membership allowed the parish to erect a new church-school in the 1920s. With the Great Depression and World War II, parishioners of St. Wendelin maintained their generous support of their parish. 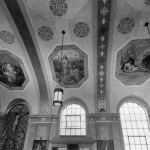 Various pastors would lead the parish through these times and in the late 1950s, Fr. Edward Stanko help concentrate the efforts of the parish towards the spiritual and corporal needs of the community’s youth and senior citizens. 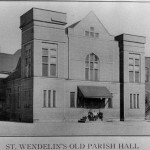 In the 1970s, due to a decline in school enrollment, St. Wendelin’s school merged into Urban Community School, a multi-parish school headed by the Ursuline Sisters. Throughout the years, St. Wendelin parish has made improvements to its buildings to allow easier access for its parishioners. Currently the parish is led by Fr. Robert Kropac.